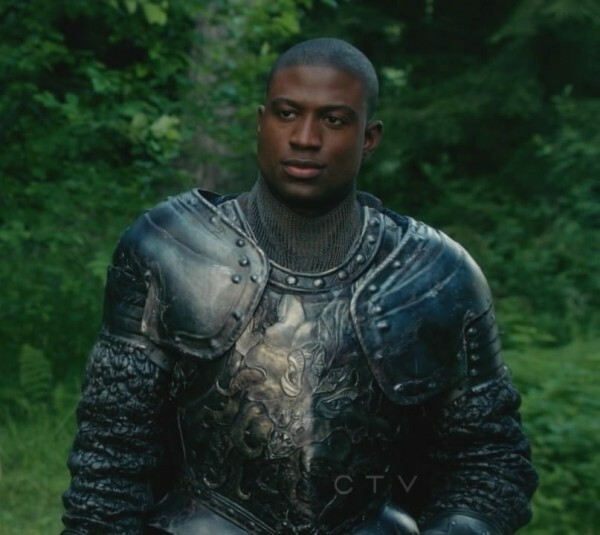 Sinqua Walls in costume as Lancelot on Once Upon A Time – Sea Monster on chest designed & carved by Azrael’s Circus. The second piece for Once Upon a Time was a little more complex and a lot more hours in the studio than the Sun for Prince Phillip’s chest piece. The concept was a menacing sea monster/leviathan with lots of tentacles for the character of Lancelot, played by Sinqua Walls . 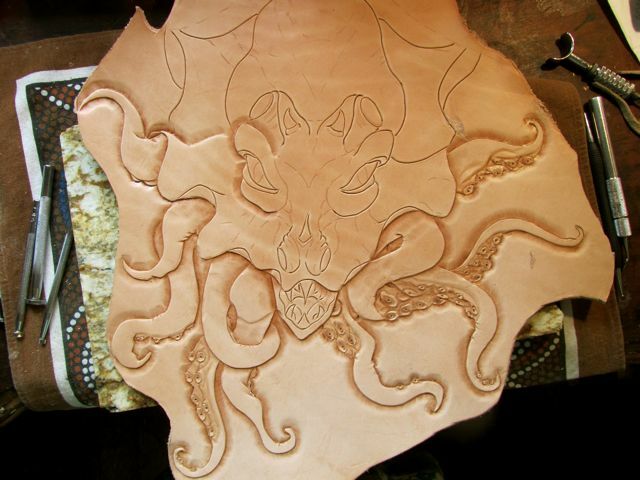 It was a large surface area to cover, the biggest single leather piece I have tooled/carved. 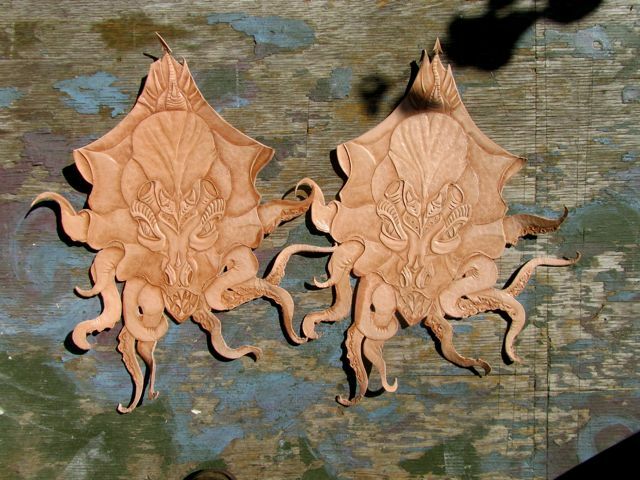 I started to look for inspiration for the design – deep sea creatures, like angler and viper fish as well as mythological depictions of sea monsters, dragons and other ferocious beasts. Most of my work has been more on the gentler and more realistic side but I was ready for the challenge. Working through a number of drafts of the sketch and combining elements until a fierce dragon/octopus/stingray hybrid came to life. Here are a few pics – I won’t get into too much detail, as the process is very similiar to the other pieces in the blog – except this leather was much thicker… so lots of heavy hammering. 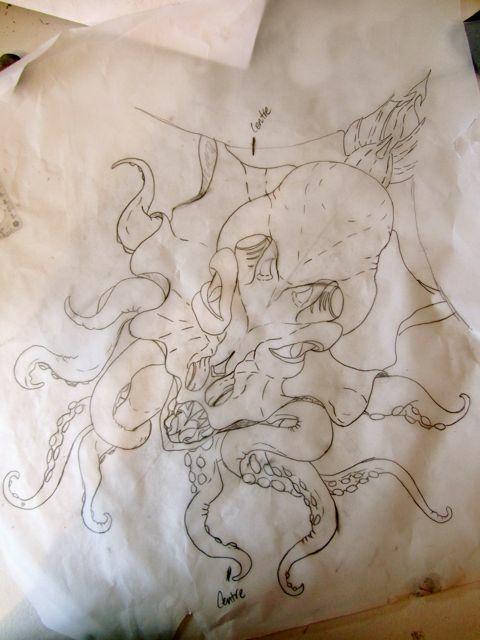 The finalized sketch of the Sea Monster for Lancelot’s armor. 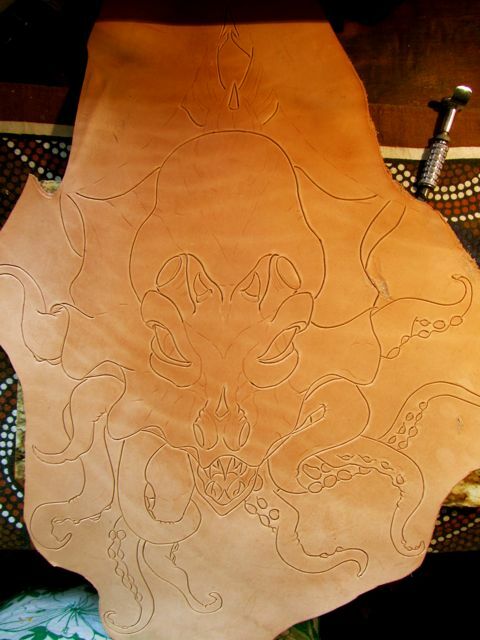 The design is traced onto the moistened leather and the outlines cut with a swivel knife. A collection of varied tools are used to bring out the dimension of the image. 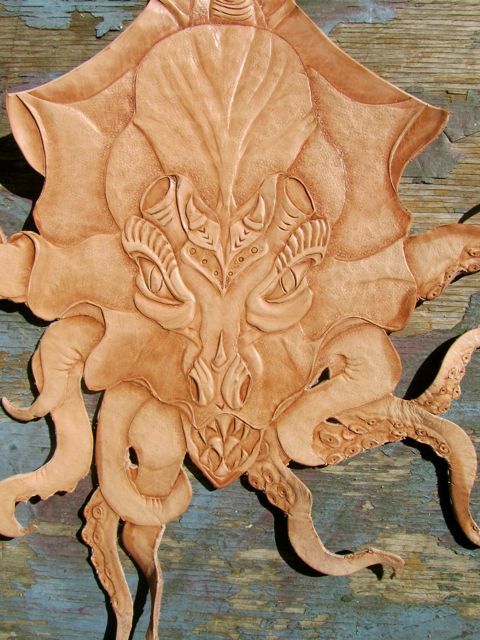 Here it is partially carved/tooled. Two identical pieces are required. Here they are, almost complete. Now to cut them out. The finished piece for Lancelot’s Costume, ready for shipping back to the studio to be adhered to the armor and painted. 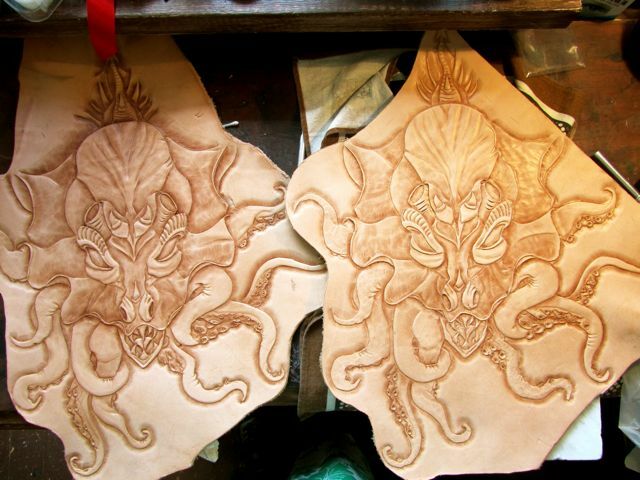 Both of the pieces finished and ready to be shipped back to the studio and assembled as part of Lancelot’s costume. 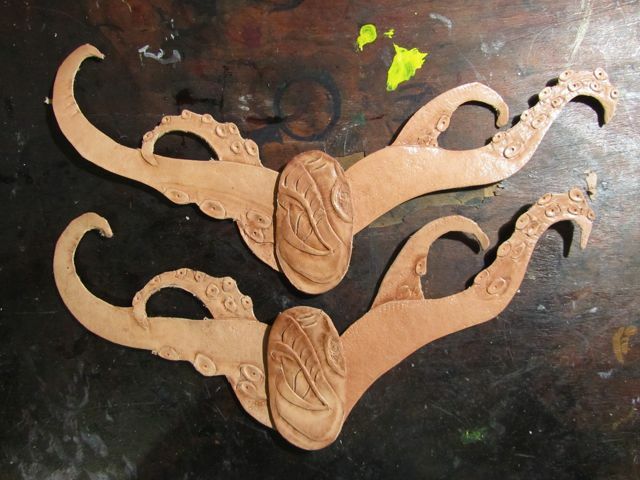 These pieces were made for the gorgette (neck piece) of the armor, but from the photographs I have seen the gorgette was not included in the final Lancelot costume.